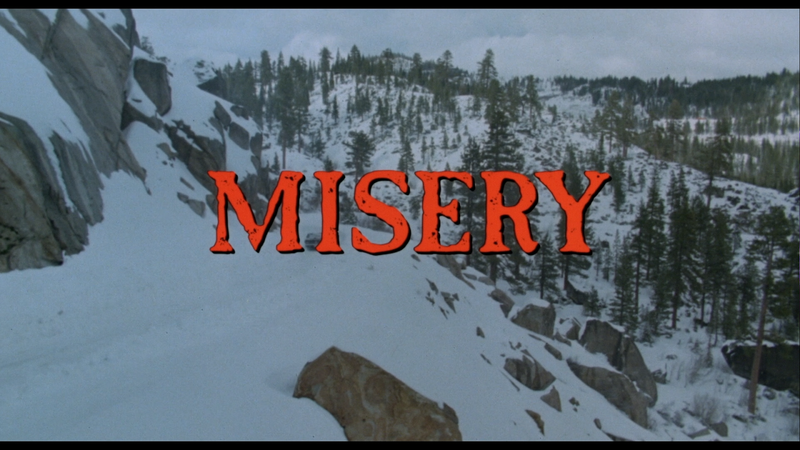 Scream Factory brings us another classic horror film in the form of Misery. Loaded with features and a brand new 4K master, how does the film hold up today? There is a mix of old and new here. 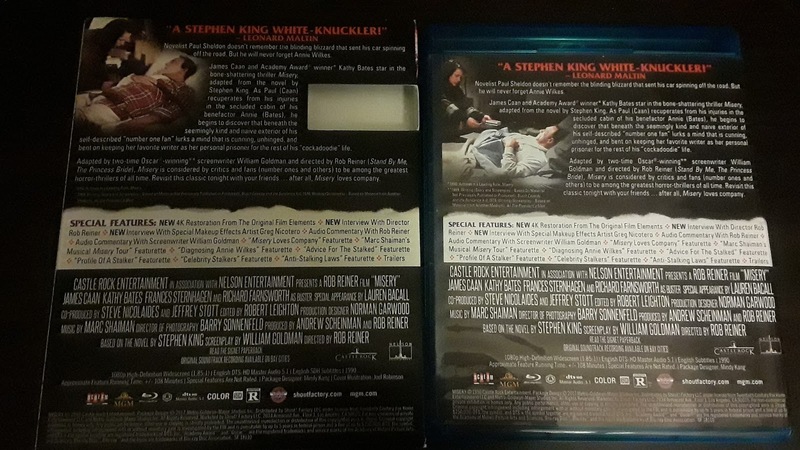 The first two interviews, with Rob Reiner and Greg Nicotero, are brand new, done by Scream Factory themselves for this release. Both interviews are great even if Nicotero covers much of the same ground that he has been covering in his most recent interviews. Reiner seems to be having a blast talking about Misery and his approach to the material. Both interviews are worth at least one watch. 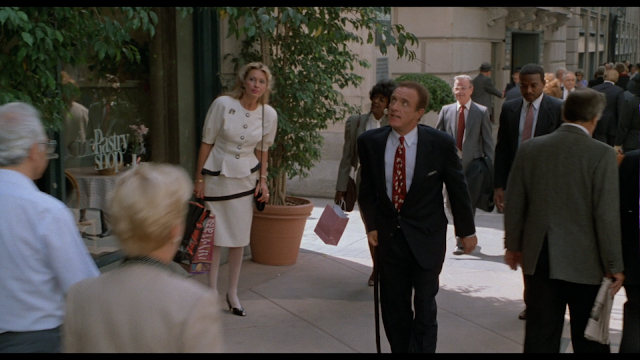 The rest of the special features, while new to blu-ray, are actually from a special edition dvd that MGM out years ago. There is the requisite making-of with most of the major players from the film. Then we have a look at the music done for the film. Both of these featurettes are really great and offer a lot of information about the film. The rest of the featurettes are about mental illness and stalking. I would have found these interesting, but they seemed very half-baked to me. None of them are over ten minutes in length and some are as low as two minutes. That is not a lot of time to cover material as important as this. I wish that MGM, or Scream Factory, had done a real featurette about mental illness and/or stalking. There is a wealth of information about both and could have been used to greater effect. The commentary tracks are both great. Reiner covers much of the same ground covered in his interview, but he expands on those ideas and more. Goldman talks a lot of adapting the Stephen King novel and how well the film turned out. Both tracks are worth the listen. 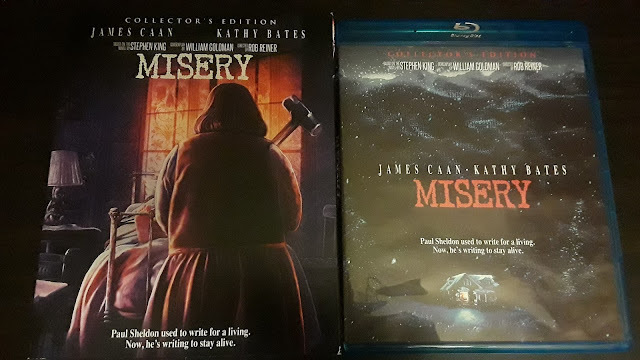 Scream Factory did an amazing job with Misery. They did a 4K scan of “original film elements” and it is one of the best they have done. Detail is at an all-time high while blacks are deep and full. 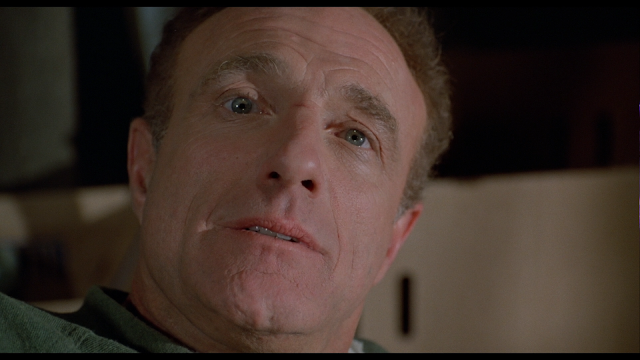 There is a thin layer of grain here which gives the film a very film-like feel. Colors are fantastic even though the film isn’t a very colorful film. Skin tones look great and the outdoor scenes look like we are really there. We are offered two different English tracks, a 5.1 and a 2.0, both DTS-HD Master Audio. Both tracks sound fairly similar to each other, but the 2.0 track wins because the 5.1 track does not really use the surrounds very well. The 2.0 track does the job very nicely with clear and crisp dialogue, no distortion, and the right amount of mixing throughout. Stephen King has had a less than stellar run when it comes to films made out of his novels. The adaptations started out strong with Carrie in 1976 which was masterfully directed by Brian De Palma. 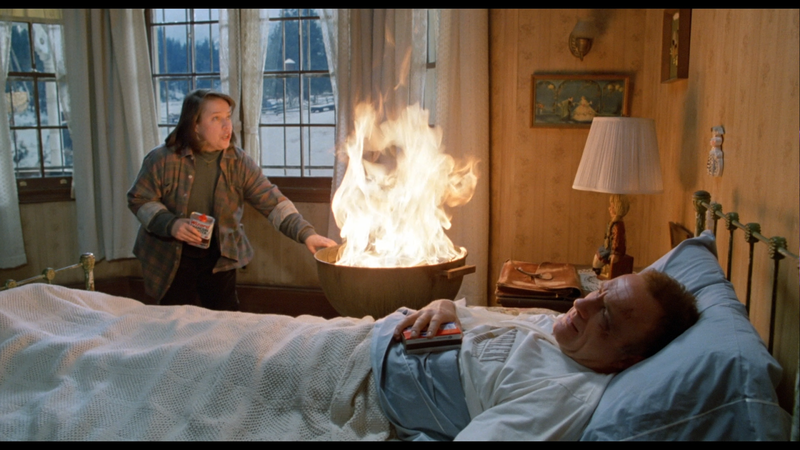 After that, we got adaptations of The Shining (an overrated film), Cujo, The Dead Zone, Pet Sematary, and Firestarter just to name a few. Some of the films were good, but a big chunk of them was not. King had decided that he was not going not going to sell the rights to any more of his novels until someone could prove that they would take the material seriously. Stand by Me would be that film. King loved the film and when the film’s director, Rob Reiner, came to him with the idea of adapting Misery, King was a bit skeptical. One of hand, Reiner had proven that he could do King’s stories justice. On the other hand, Reiner had never done anything even remotely close to a horror or a thriller. Reiner had to convince King that he would be able to handle it and King sold him the rights. 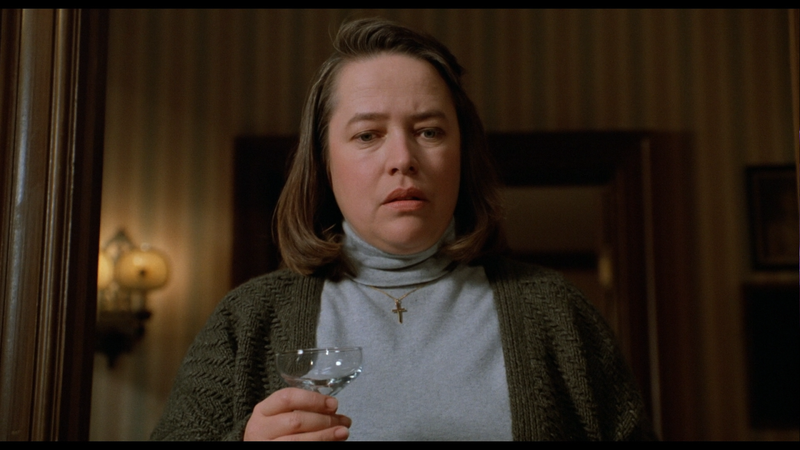 What came was a film that won over audiences and won Kathy Bates an Oscar for her performance. The film was a box office hit and the critics seemed to love as well. 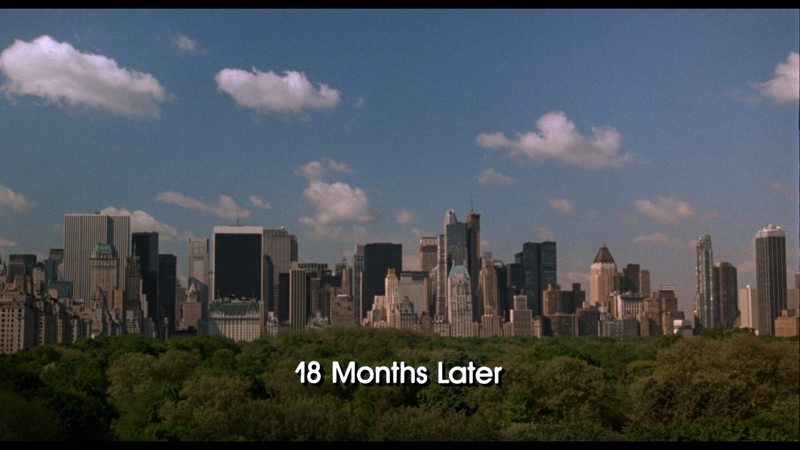 So, how does the film hold up almost thirty years after its release? I never thought Misery was that great of a film. Don’t get me wrong, the film is good and there are some great scenes in it, but I find that the film is just good. It doesn’t strive to be anything but good. The film seems to be comfortable in repeating beats from other films. It is like someone who gets a job and becomes good enough at the job to not get fired. The person never gets any type of recognition or promotions because they kind of blend into the background. Misery does just this but stands out just enough to be noticed. I think that, by now, we all know about the “hobbling” scene. 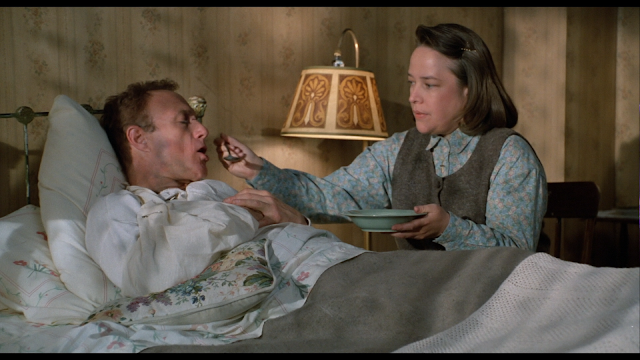 Kathy Bates find out that James Caan has been outside of the room that has become his prison while she is out getting food and medical supplies. 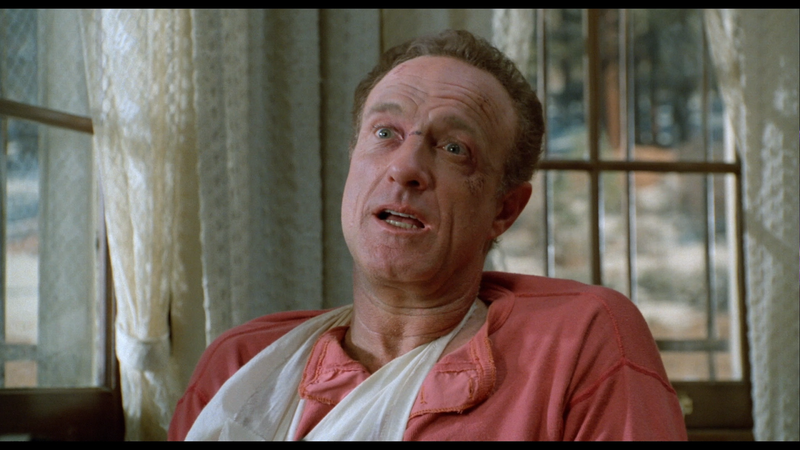 She then brings out a plank of wood and puts it between his still healing legs while explaining what hobbling is. She then takes out a sledgehammer and breaks his feet. I am of course not doing the scene justice, but there is one thing that I noticed during this most recent watch: the scene moves way too quickly. Rob Reiner seems to want to get through the scene as fast as possible. I have no idea why, it could be that he didn’t think that audiences would be able to handle the scene, or maybe, because the scene comes pretty late into the film, that the audience would grow tired of another scene in the film. Whatever the case may be, the scene still has power to it. We really have no idea what she is going to do (in the book she cuts off his feet), which makes us incredibly nervous, but the way that the scene is edited doesn’t allow for enough tension to build. I think that maybe Reiner thought that the scene was the right length, but I think that it should have gone on longer. It is too short and is over way too quickly. By the time we have an idea of what Bates is going to do, she has already hit the first foot. Sure, the impact is powerful and gut retching, but the suspense is fleeting. 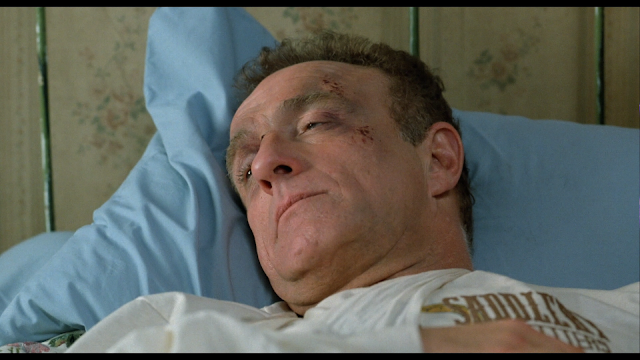 A better scene is when the sheriff goes to the house to see if Bates has Caan there. The back and forth between Bates and the sheriff is really good and Reiner lays the suspense of thick. By the time the climax of the scene happens, we feel like we have been on a roller coaster. The ups and the downs of the scene are incredible and the finish is well worth the ride. 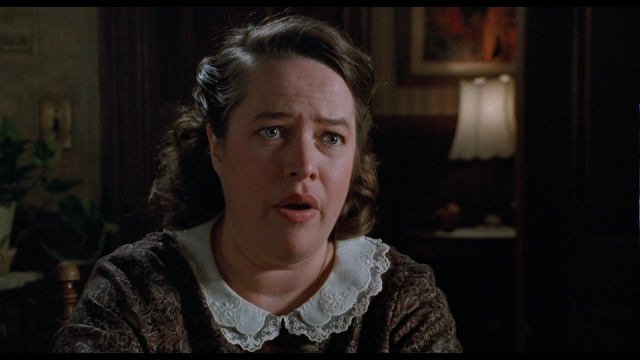 I can’t finish this review without talking about Kathy Bates. This was the first film that I saw her in and I instantly became a fan. I would watch anything she was in because she has such presence. I even watched a film called At Play In the Fields of the Lord, a film that runs over three hours in length and feels like it was way longer. 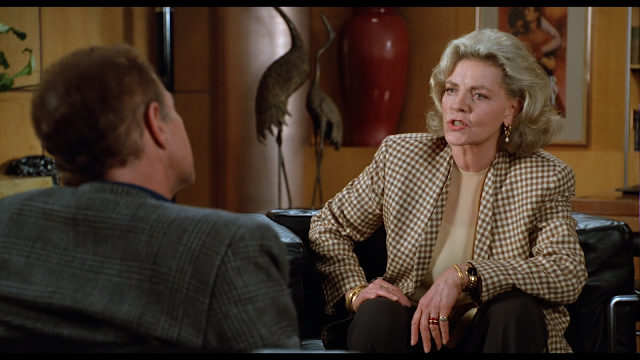 Another film that she overtook even though she was a supporting character was Primary Colors, the fictionalized account of Bill Clinton’s presidential run. She is a wonder to behold in the film and should have won an Oscar for the role. 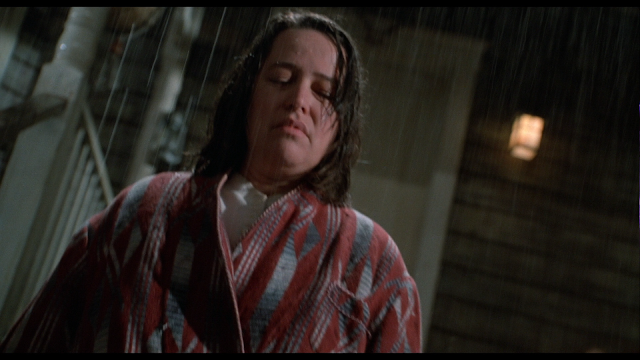 In Misery, Bates plays “crazy” without it becoming comical. Many actors would have played the role over the top and wild, but Bates knows that how everyone expects her to play the role so she adds some subtly to the role. There will be a look or a glance that she provides that gives us a lot more information about what she is thinking. Of course, she does have scenes where she loses it, but those scenes are kept to a minimum and work so well because we are not expecting when to come along when they do. Her Oscar win was one of the best choices the Academy has ever made. 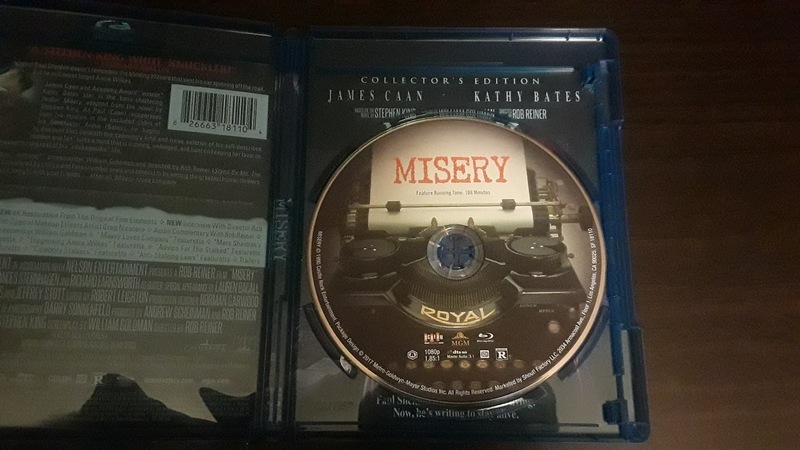 Without Bates, Misery might not have worked. 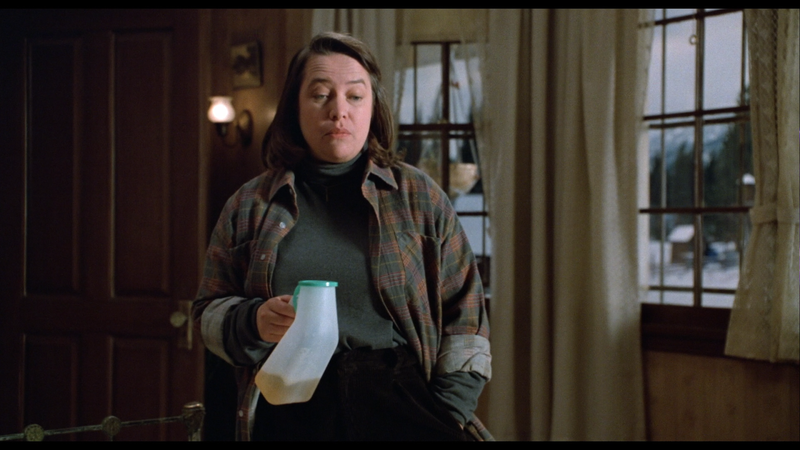 Misery is a good film, but it is content to stay there. It never tries to do anything outside of what is the norm for the genre. 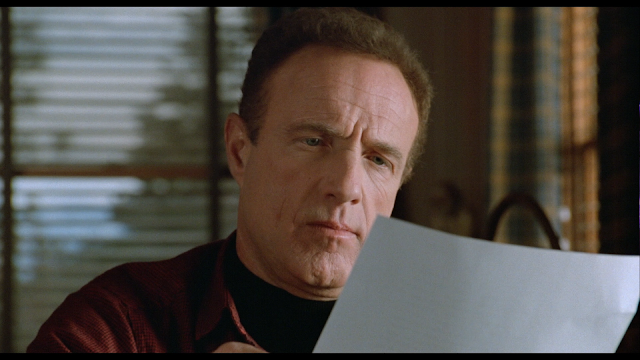 There are scenes of suspense, but some of the best scenes are the character scenes. 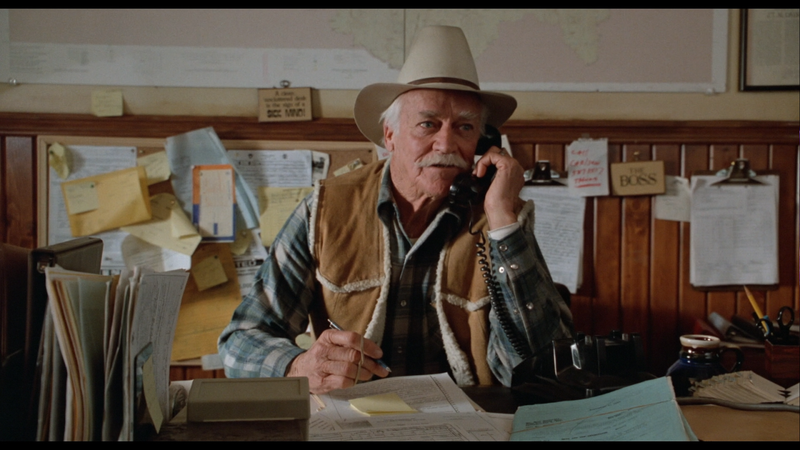 The scenes between the sheriff and his wife are great and I wish that a film was made using them as the focus. Misery isn’t the best King adaptation, but it isn’t the worse either. It is right in the middle where I am sure it wants to be. 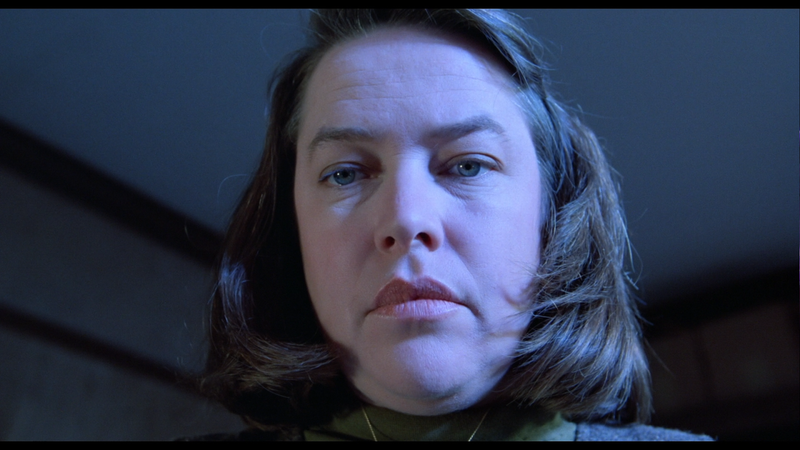 Misery is a perfectly fine thriller that doesn't try to excell in the genre as much as it just wants to be there. 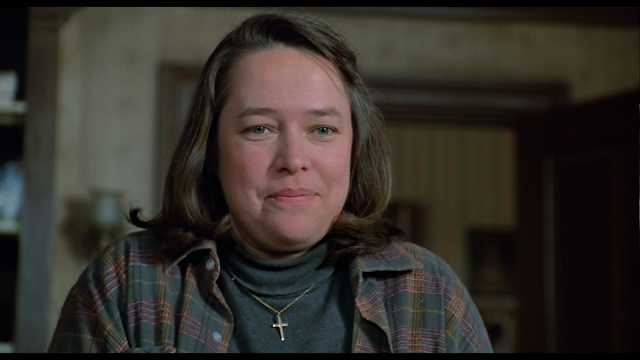 The performances are good all around, but Kathy Bates takes her role to another level. She won an Oscar for her portrayal of a woman who is obsessed with someone so much that she would do anything to keep that person in her life 24/7. 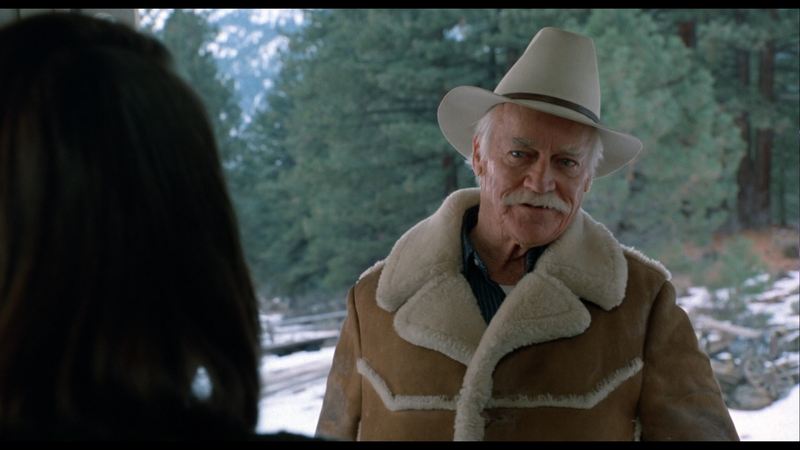 Rob Reiner does a fine job directing the film, but you can tell that he cares more about the performances than he does about the thrills a thriller promises. 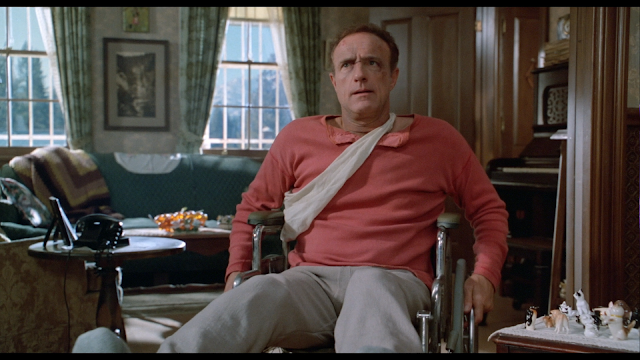 The leg hobbling scene is still cringe inducing 28 years later which is a good thing. 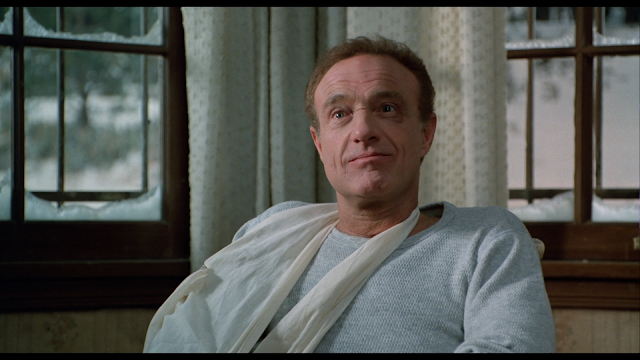 The film is worth watching and enjoying for the performances and the leg hobbling scene. 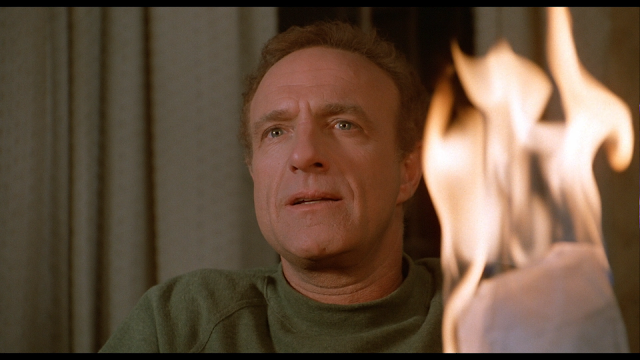 The blu-ray, from Scream Factory is a marvel to behold. The brand new 4K remaster is just gorgeous. Misery hasn't looked this good on a home format ever. The sound is good as well. The special features are nice, mixing a few new interviews while porting over those features found on the special edition dvd from long ago. Add to that some stunning artowrk from Joel Robinson and you have yourself a wonderfully crafted blu-ray. CHECK OUT PAGE 2 FOR MORE SCREENSHOTS!!! BE AWARE THAT SCREENSHOTS MAY CONTAIN SPOILERS!! !